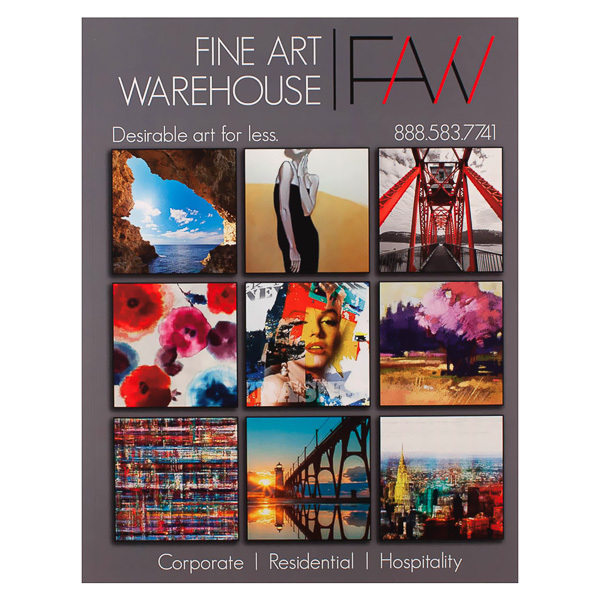 A collage of photos and paintings showcases the custom pieces Fine Art Warehouse collects and sells. At the top of a stylish gray cover, FAW's red and black logo contrasts the white type used elsewhere. The right pocket features contact information, the brand's slogan, and an invitation to use the flash drive contained in the pocket. On the back cover, three wide photos show rooms decorated with fine art. The flash drive pouch near the centerfold equips the right pocket to hold mixed media. A locking tab at the top of the pouch gives your flash drive 360-degree protection, while a 3/4" triple-score backbone gives the front cover space to lay flat when the flash drive is inside. With the pouch on its exterior, the pocket can still carry 8 1/2" x 11" paper. Spice up the interior with colorful imagery or informational copy on the vacant left panel. Dimension Open: 18 3/4" x 12"